Place Texas toast in toaster until crispy. In a blender combine Texas toast, rosemary, thyme, parsley, salt and pepper and blend until smooth. Gently coat grouper with blended toast and herb mixture. Pre heat a large sauté pan with olive oil to medium heat and place grouper with coating into pan. Sautee both sides of grouper until golden brown and place grouper on baking sheet into pre-heated oven at 350 degrees for 5 minutes or until done depending on thickness of fish. Plate fish over Quinoa Mediterranean salad, drizzle with dressing and serve. Slice and toss ingredients into mixing bowl. Recipe Author Chef Luigi Maestri is the Executive Chef at the Pilot House Restaurant in Key Largo. Coat all sides of tuna loin with sesame seeds covering entire surface of tuna. Pre-heat a medium sauté pan over high heat with sesame oil. Sear all sides of tuna loin for 5 seconds a side being careful not to overcook as tuna is served rare. Remove tuna from heat quickly and flash cool in refrigerator. Slice tuna into thin strips and serve over a bed of mixed greens. Place side of wasabi paste and pickled ginger around the plate. Drizzle tuna with the sweet soy bourbon glaze. In a pre-heated hot sauce pan add bourbon and cook off the alcohol. Add the sweet soy glaze and reduce until sauce thickens. Season both sides of fish with salt and pepper and place on pre-heated grill. Grill fish for 1 & ½ minutes each side or until cooked thoroughly. Remove fish from grill. Pre-Heat a medium sauté pan over medium-high heat and add the Jefferson Bourbon. When the flames subside, meaning the alcohol is cooked off, add butter to the pan and then add the fish to the butter and bourbon mixture, coating the fish completely, then quickly remove fish from pan. Lightly grill the tortilla shells until warm. 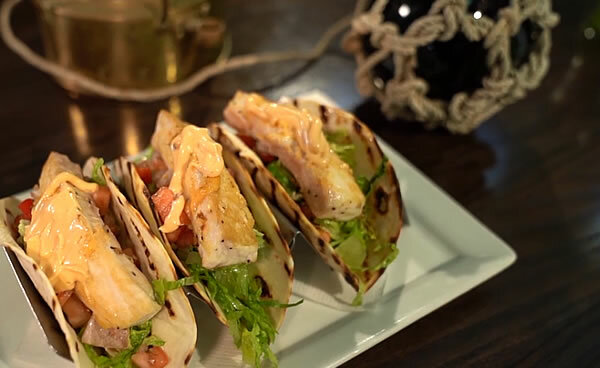 Place warm tortilla shells on plate and fill with 2 fish fingers, 1 oz lettuce, 1 oz Pico de Gallo and drizzle with Chipolte Aioli. Repeat the same for each taco and serve. 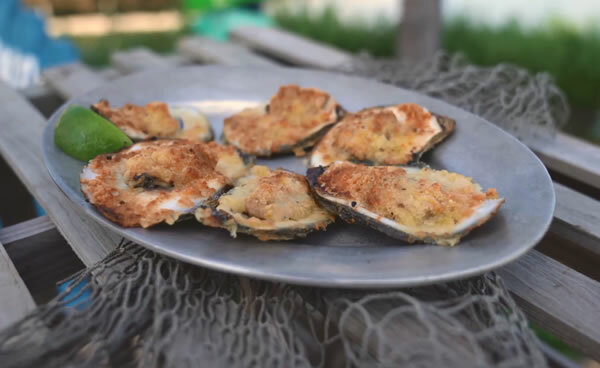 Grill oysters until they are hot, bubbly and the cheese has begun to “puff,” approximately 6 – 8 minutes. Enjoy! Bobby Stoky, chef and cookbook author is the proprietor of many Upper Keys restaurants. Cut each banana in half and then cut again, so you end up with 4 long slices of each banana. On a small plate mix cinnamon and sugar, then roll bananas into mixture. Heat a small skillet over medium heat and add 1 TBS olive oil. Sauté bananas until warm and soft. Remove from heat, and set aside. Warm marinara sauce over the stove or in a microwave until well heated. Hold aside. Season mahi filets with salt and pepper. Place a large skillet or frying pan over medium high heat, and add extra virgin olive oil. Sauté mahi 3-4 minutes per side, until fish is light and flakey throughout. Top fish with marinara sauce and sautéed bananas. Sprinkle with basil ribbons and Enjoy! Mojo Marinade (can be prepared 3-4 days in advance) or if available from your grocer, you can buy premade mojo marinade in the marinade or Spanish food section of your store. Prepare the mojo marinade by mashing the garlic, salt, and black pepper in a mortar or food processor. Stir in the juice allow mixture to “sit” for at least 30 minutes. In a sauce pan, heat the oil, basil, oregano, cumin and chopped onions over medium heat until the onions become soft. Remove oil from heat, cool, and add to juice mixture. Refrigerate mojo marinade after making. 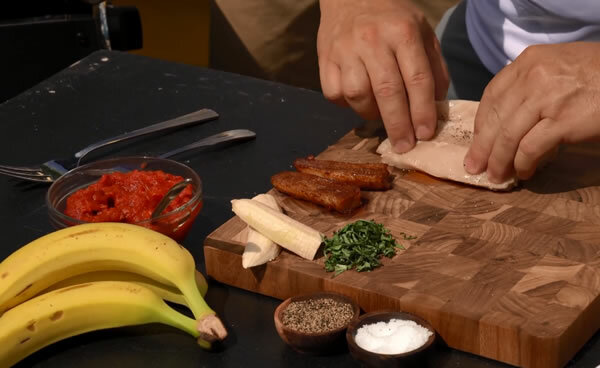 Add grouper fingers to mojo marinade and allow the fingers to marinate in the refrigerator for not longer than 2 hours, or until the outside of the fish fingers begins to turn white, as the citrus in the marinade will begin to “cook” the fish. 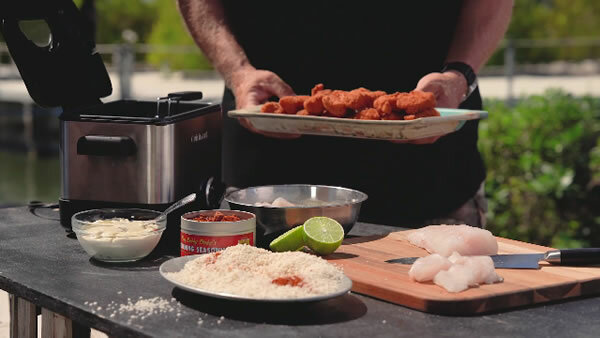 Remove grouper fingers from mojo and dredge in bread crumbs. Place battered fingers into the refrigerator and fish filets to “rest” for at least 30 minutes before frying, so the batter can “set.” Heat frying oil in sauté pan on medium high heat until oil is approximately 350 F (make sure oil is hot, but do not allow it to burn). Place fish fingers in oil and cook for 3-4 minutes, until fish fingers are white and flakey throughout. Remove fingers from oil and drain on paper towels (a brown paper bag, lined with paper towels works great for this). Serve fish fingers with Key limes and tartar sauce! In a large, deep sauté pan or fryer, preheat enough vegetable oil to cover onions. Heat oil to approximately 350 degrees Fahrenheit. In a medium bowl place 1 cup flour and blackening spice. Toss sliced onions in flour mixture and lightly shake off any excess flour. Place dusted onion rings into hot oil, and fry for 4-5 minutes, stirring onions occasionally, until onions are dark brown. Remove onions from the oil, and place on paper towels to remove any excess oil. Allow onion rings to cool to room temperature. 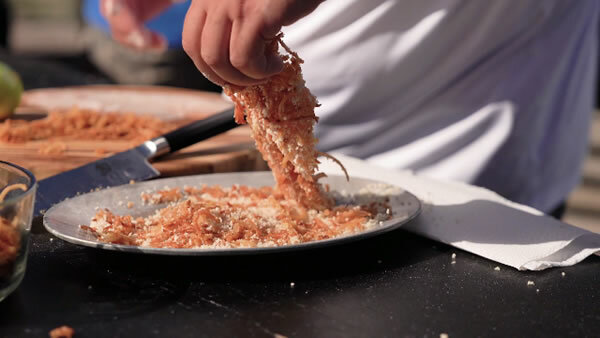 Then using a kitchen knife or a food processor, chop onion rings until they are about the size of the panko bread crumbs. Place chopped onion rings and panko bread crumbs into a medium bowl, and mix well. Dredge snapper filets through remaining flour, then through the beaten eggs, and then press snapper into the onion ring and panko bread crumb mixture. Place a large sauté pan on the stove and add enough oil to just coat the bottom of the pan. Place battered filets into the sauté pan and sauté over medium high heat for 3-4 minutes per side, or until onion crust is lightly browned. Remove sauté pan from the stove and place into an oven preheated to 350 degrees Fahrenheit, until snapper filets are white throughout. Approximately 10 minutes. Remove filets from oven. Top with Key lime butter and enjoy! Melt butter over medium heat, add dry white wine, and key lime juice. Remove from heat and let rest at room temperature. In a small sauce pot over medium heat, add the butter, pineapple juice, and bourbon. Allow the butter to melt and the mixture to come to a light boil. Reduce heat and add brown sugar and stir to dissolve. Once dissolved, remove from heat and add the heavy cream. Add salt and pepper to taste. In a small bowl, mix cornstarch and water until all clumps are removed and slurry is of an even consistency. Add this to your warm bourbon glaze until your glaze is as thick as BBQ sauce. Taste glaze again and add more salt and pepper if necessary. Stuff shrimp with cheese and jalapeno strips and wrap each shrimp with one piece of bacon. Pre-heat flat top grille to medium high. Season grill with oil and place shrimp on grill. 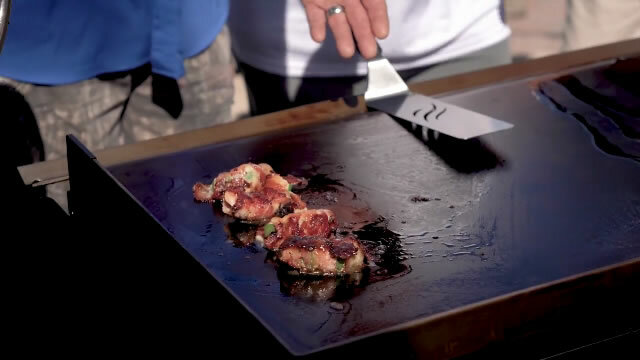 Grille for 3-4 minutes per side, or until shrimp are white throughout and bacon is cooked. Brush both sides of shrimp with bourbon glaze and serve hot and tasty.